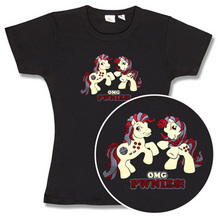 OMG Pwnies!!11!!!!eleven!! It’s a t-shirt for those of us who grew up with a love of Carebears, Sylvanian Families and My Little Ponies but have graduated onto an appreciation of all things geek. A meeting of the old you and the new you. A nod to your past in the epitomisation of your present. A t-shirt. It’s $12.99 from Think Geek, but be warned. Whilst they assure us no ponies were harmed in the making of the shirt, they do point out that the red glitter (yes, there’s glitter) is unicorn blood. But the unicorns would have wanted it this way, I’m sure. More geek chic? Click here.